Martin Jonas was born in 1924 in Kovacica, Serbia (formerly Yugoslavia). A self-taught artist, he began painting as a child. He was a theater set decorator and a writer for the pin-up newspaper “Bojovnik.” During World War II he joined the Partisans and in 1944 he began his artistic career. 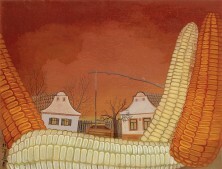 In 1941 he joined the Kovacica “school” of naïve art. He is a co-founder of the arts and ethnic section of the Cultural and Educational Society of Pokrok, Serbia. 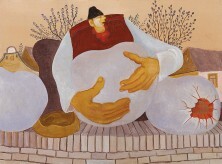 In 1955 he participated in the establishment of a farmer-painter gallery in Kovacica, Serbia. He died in 1996.